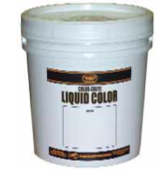 Looking to buy Increte Integral Color – Color Crete Prepackaged Liquid in Rochester NY, Ithaca NY and Western New York? With an A+ reputation for customer service and prompt pick-up and delivery, the Duke Company proudly carries the full line of Increte Stamped Concrete System products. Water based and ready for immediate use. High-tech, precision blend of synthetic iron-oxide pigments. Specifically engineered to be used for cast-in-place, slab, precast, tilt-up, pavers and roofing tiles. The Duke company carries a range of convenient sizes in 1 year increments – including 1 gallon, 3.5 gallon and 5 gallon pals. Notably, the product is dust free, lime free, and UV resistant. Available in 35 standard colors.